In fishing, the narrow strip of boneless meat from either side of a fish's spine..
Other groundfish that are caught commercially in Maine include cusk, monkfish, plaice (or dab), and wolf fish. Relatively few sharks are found in Maine waters, with the 3-4 foot dogfish the common species. Offshore in summer are found blue sharks in the 12 foot range. Other species are uncommon. With the passage of the Shark Finning Prohibition Act of 2000, catching sharks for their fins for shark-fin soup in US waters has been prohibited. However, that is a serious threat to shark species in other waters. .
One of the salmon family, it is chiefly a fresh water fish with several species. Some can be anadromous and found in salt water.. 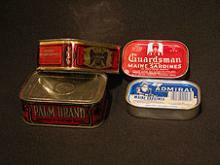 These are preserved best smoked, but historically were not preserved for long periods like cod and mackerel. Alewives are a popular bait fish for lobstering. Growing fish or shellfish in a controlled environment at sea or in tanks or lagoons on land. Fish grown in such an environment are said to be farm-raised. pens. A small swimming crustacean, typically caught commercially by trawling. Maine's shrimp are northern shrimp, and the Gulf of Maine is at the southern limit of their range. The fishery is a winter fishery which began in the 1930s., and lobsters. Red tides are harmful algae blooms, when phytoplankton grow quickly and are visible. Some of these phytoplankton are toxic and can kill animals that eat them. Shell fish beds are especially vulnerable as shell fish feed by filtering water, which concentrates the toxins, although the shell fish themselves are not harmed. Red tides will close areas to shell fishing. and poor water quality can close the fishery. Marine organisms that are caught unintentionally when fishing, usually by towed nets. A bycatch can be very large and is usually discarded, something that is now being seen as wasteful and ecologically damaging..
Today, lobsters are the most valuable fishery in Maine, second only to herring in tons of fish landed. Click here to see images of shellfish harvesting from PMM's photo collection. The layer of fat found under the skin of marine mammals like whales, porpoises and seals. It stores energy and serves as an insulator. Heated, it can be rendered or melted into oil. for oil, and harbor seals were sometimes hunted for their furs. Today all marine mammals are protected by the Federal Government and may not be hunted or disturbed. Young eels returning to fresh water where they will live as adults before going to sea again to spawn., or baby eels, are also considered a delicacy in the Far East, and eels are fished for use as bait. For more information on Maine and Northeast Atlantic fish, see the Maine Department of Marine Resources web page on species Information.